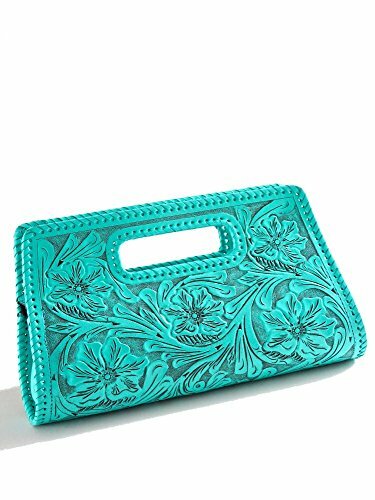 Que Chula Sobre Chico (Small) Handtooled Leather Clutch Purse Turquoise SOBRECHICO-TURQ. The Que Chula Sobre Chico (Small) Handtooled Leather Clutch Purse in Turquoise is constructed of cowhide leather, featuring beautiful floral design tooling and whipstitch edge trim. It has a zippered closure and is unlined. (Also available in Grande version.) More colors available! Details for Que Chula Sobre Chico Handtooled Handbag: 11" W x 7" H x 3.5" D; Handtooled; Tanned cowhide leather; Unlined interior; Hand made in Mexico. If you have any questions about this product by Que Chula, contact us by completing and submitting the form below. If you are looking for a specif part number, please include it with your message.